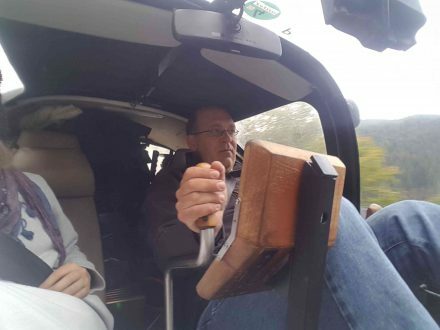 I haven’t been updating TDIN20160’s travel-log on a daily basis as usual – in this entry, find out why! But first, back to Day2 of my much-anticipated trip to Austria, via Italy and Slovenia with my youngest daughter. We sleep very well with fresh alpine air and the cozy smell of all the wood in our chalet room. Madesimo is between Seasons, we’re the only ones at our Bed & Breakfast and seemingly the only ones in the village – no-one else was to be seen as we leave the village. 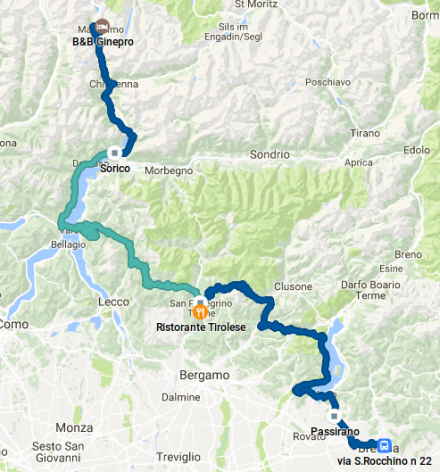 Today, we’re going to travel to Brescia, a medium-sized city in northern Italy – as usual, we’re going to stick to extremely small roads and try to take in as much rural scenery as possible. 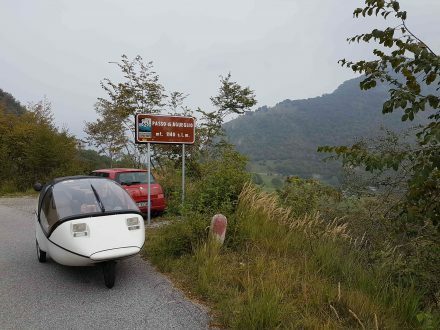 I haven’t charged the batteries fully, since we’re going to be going from 1700m to 250m within 10km and can top off the charge by recuperating down the many kilometers downhill. 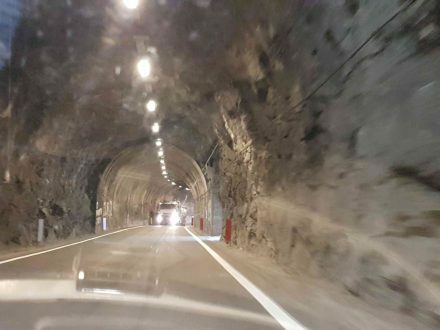 Whilst we choose the old pass road on the first few km, we’re forced back on to the main road which itself isn’t always as wide as we would wish for – see for yourself! Oh! Let’s just hope we can get past each other! 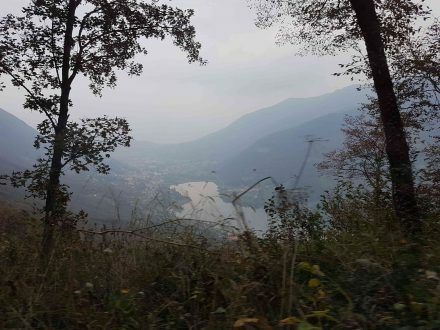 Arriving in Chiavena, the valley opens up and flattens out – it’s just a few km to lake Como. 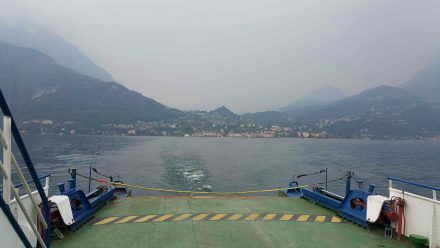 We will be taking some small side-roads to get to Menaggio, where the ferry to Varena departs. 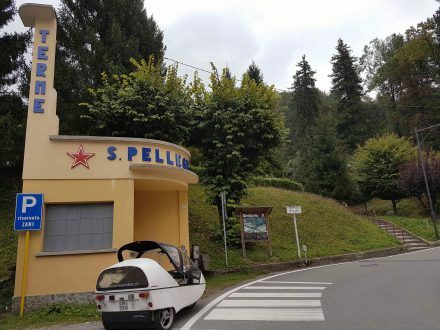 Driving along our single-lane roads towards Menaggio, we stop at a very small bar for my first true Italian coffee. Priced at €0.80 and superbly tasty, it marks my true arrival in Italy. 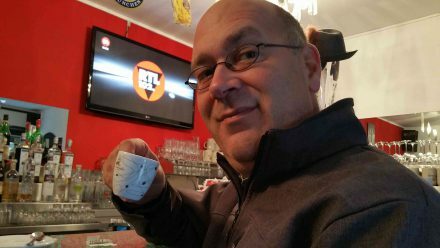 Readers of this blog know how important this little ritual is to me – and has been since my teenage years in Italy when I learnt to appreciate the fine art of going to an Italian bar and get a perfectly made and presented coffee! Finally! Able to start my day in style! 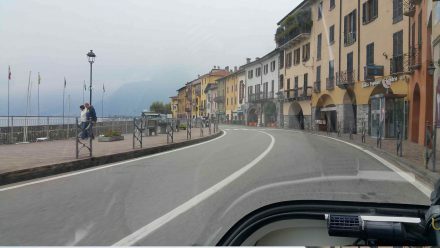 About 40 minutes later, we arrive in Menaggio and drive on to the very small ferry linking Menaggio and Varena, the starting point of the first climb for today. How about I show you how this beautiful place *could* look like? Following video was shot 6 years ago during TDI2010, when TW560 had a range of about 45km! 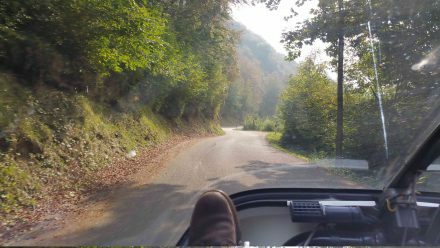 After arriving in Varena, we immediately start climbing up the first hill – I definitely have to come again when the weather is better! 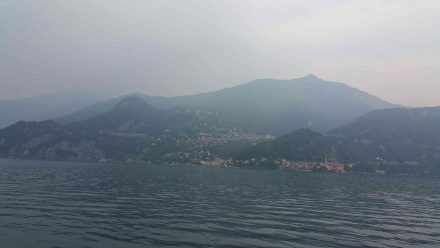 Even with all the haze, the views we are treated to are extraordinarily beautiful! 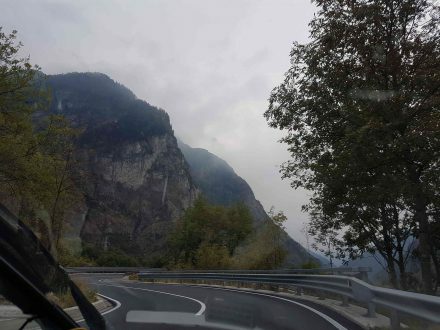 From here onwards our road winds its way down to the town of San Pellegrino Terme past some very impressive stone formations and gorges…and get to see some sun! 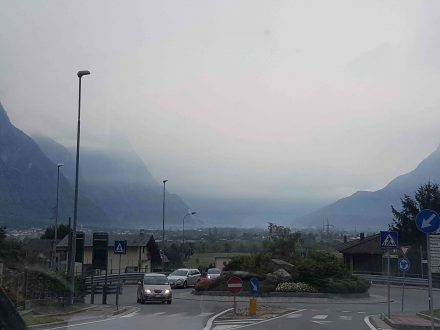 At 1.30pm we’re quite hungry as we arrive in San Pellegrino. As in June, I’m shocked to see all the past glory crumbling away. We find ourselves a restaurant that serves local specialties and order some Bergamascan food. YUM! 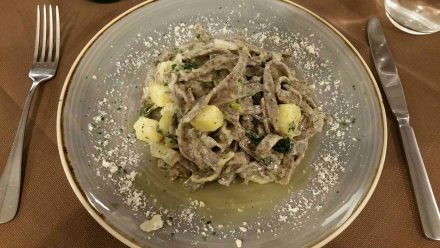 Some of the tastiest pasta I’ve had in a very long time! 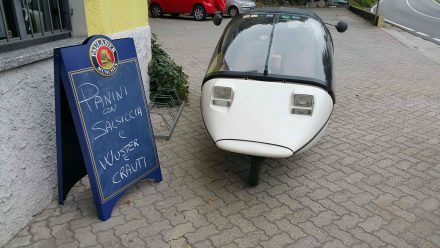 We’re ready for the last 90km to Brescia. 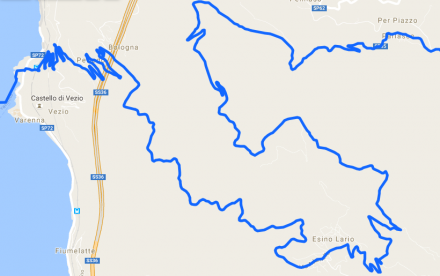 Again, this part of the trip will be along very small roads and take us up some pretty steep gradients. I was thoroughly looking forward to it! And off we go! 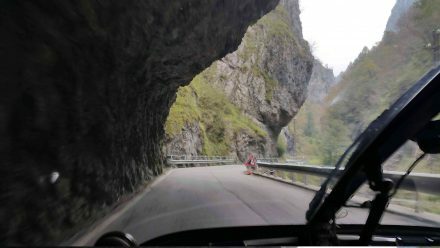 The steep bits are around 16-20% and very challenging – the roads themselves are extremely rewarding – no cars, and beautiful views! I just love these roads! One of the following climbs is too steep, even if we attempt to make the climb at a higher speed. 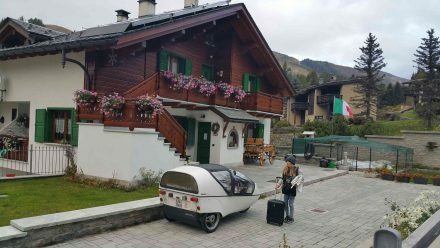 I tell my daughter to get out of the TWIKE and start to get out myself. Whilst getting out, I somehow misstep and instinctively try to stabilize myself against the gradient when I feel a distinct snap in my lower leg. I howl in pain, lose my balance and go down like a target in a sniper’s cross hairs. Pain – my leg is pulsating – pain – I can’t extend it – pain – nor can I bend it. Going though the usual self-checks, I notice part of my muscle on my left leg is sagging and swelling. After a few minutes pain levels are receding – I slowly explore the movements that are still possible. 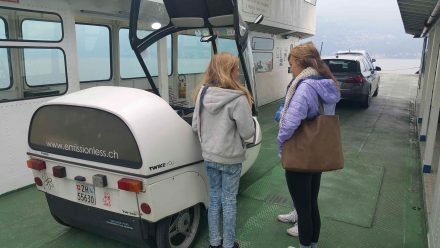 My daughter stands beside me and – eventually, as my adrenaline levels slowly go back to normal again – helps me back into the TWIKE. 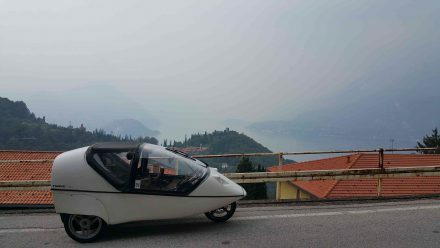 Thankfully, the layout of a TWIKE actually is of invaluable help to get us going again: I place my foot on the pedal and using my other foot bring my leg into a slightly bent position which is the least painful and since it is extended upwards, the pulsating sensation in my muscle is greatly reduced. 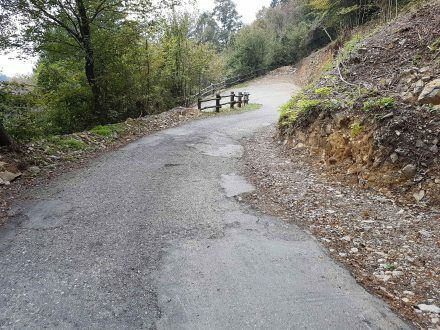 One last attempt at the same steep bit without my daughter in the TWIKE sees us get past this impasse and on our way to Brescia. 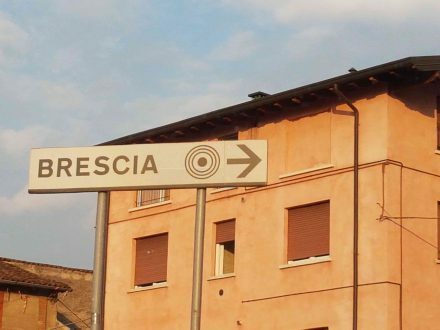 The rest of our trip is nice, but we drive at much higher speeds in order to get to Brescia sooner than later. 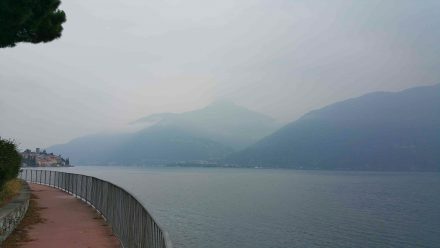 Lago d’Iseo will have to wait for a next time. 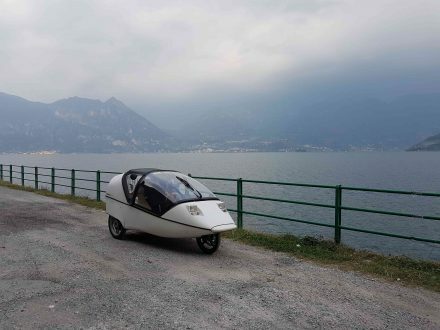 From Lago d’Iseo to Brescia, we speed things up and arrive at Brescia at sundown. I asked him if he could take me to the pronto soccorso (A&E) to get my leg checked out. He insisted that it would make more sense to go early next day, since we otherwise would spend the night at the hospital waiting to get taken care of. (I must add that I’ve already spent a full night at an Italian hospital with a broken arm, waiting for it to be looked at – so I wasn’t surprised.) 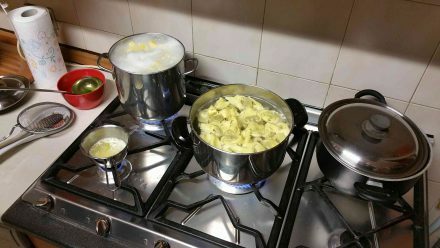 Given my previous experience and my leg actually not hurting too much when it wasn’t moved led me to heed Felice’s advice and proceed to enjoy – as much as I could, given the circumstances – his home-made tortellini with a super-simple butter/parmesan seasoning. Lying in bed that evening I thought of all the consequences this mishap might have – most probably the end of TDIN2016, maybe not being able to go to Austria, maybe having to go to Sri Lanka on crutches early December and what about my beloved skiing vacation early January?